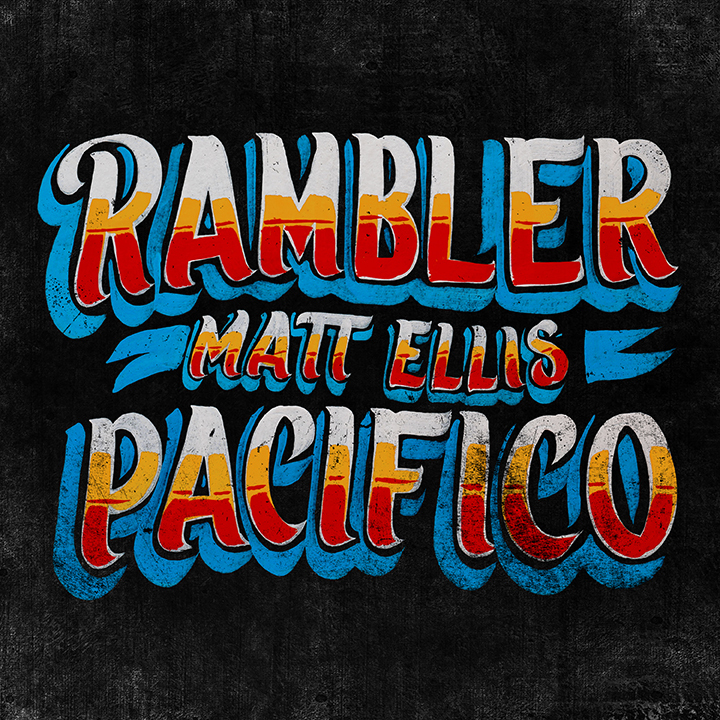 Matt Ellis’ 6th album, “Rambler Pacifico” is out now and available at all major music outlets. “Rambler Pacifico” is a stream of folk-rock consciousness. A ramble of plain truths in a time of fake news. A collection of songs that speak to these times yet feel timeless. Recorded primarily in Ellis’ garage, these 11 songs kick and caress in equal parts. There’s enough twang to remain in the Americana club, yet there’s also a pop sensibility calling to a wider audience. the sketches of Matt’s 6th album were ready for color. Matt’s core band members began building on the drum tracks at Ellis‘ home studio, a converted garage in Mar Vista, Ca. Australian engineer, Lewis Fordham, stepped in to record as Matt layered acoustics before Dustin Bookatz added Bass, followed by Guitarist, Josh Norton. Sessions moved fast with Ellis keeping things fluid, opting for the right feel over the right note. Tim Walker peppered in his pedal steel, while guests stopped by to improvise. Nick Luca (Calexico, Devotchka) was heavily involved, adding Farfisa, Rhodes, Moog, Guitars and more, both as a musician and additional engineer. Matt reached out to friends as they traveled through town, Craig Schumacher (Harmonica) and Joe Novelli (Lap Steel) from Tucson and Pete Okie Weiss (Accordion & Mandolin) came in from Austin. Matt knew his longtime Australian friend and Guitarist, Douglas Clarke was the perfect player for “Guns & Drugs”, who recorded his pickin’ licks both in L.A. and remotely, back home in Sydney. Friends dropped by to listen and drink and would inevitably end up singing harmony on a chorus or tracking hand-claps. The sessions were adventurous, loose and open to experimentation, qualities that define this new album. Ellis wrote candidly of the world around him as it happened and a lot was happening. Halfway through recording, Matt and his wife, Vavine, discovered they were expecting a baby girl, Magnolia. That untitled, mid-tempo, acoustic lead shuffle that was hanging around soon became, “Oh My Magnolia”. The duet is a message to the couples unborn daughter, welcoming her into this world, and that’s exactly what it did. Magnolia, now 9 months old, was actually born to a rough mix of the song. And that gorgeous vocal by Vavine was recorded when she was 39 weeks pregnant. Other standout songs on the album are “Some People”, the first single, which has already received an Honorable Mention in the Americana Category of the ISC. The Sociopolitical opener, “Isolationist Blues”, a personal favorite of Matt’s, and “The Kids Of America”, a thumping, rock anthem, written in support of the teenagers behind the #NeverAgain movement. Another song that deserves attention is track 8, “If I Had A Hammer”, a Pete Seeger/Lee Hayes cover featuring Kam Franklin of The Suffers. Fordham had worked on The Suffers debut Album in Austin back in 2014 and as a live engineer, touring with the band in 2015. Matt had the pleasure of performing with the group on several occasions too, putting Kam at the top of their wish list. Luck would have it, Kam was in L.A. putting the finishing touches on her recent solo EP at the time of recording, and she accepted the invitation to sing. The 1949 protest song has been reimagined, with a laid-back, Laurel Canyon feel, but the message is still clear and more compelling than ever. Additional sessions took place at Steve McCormick’s studio down the street from Matt, where Nick Luca played the Piano part for “Oh My Magnolia”. Horns and one last Guitar part where recorded at Tucson’s Wavelab studio by Chris Schultz. Jacob Valenzuela, Tony Rosano, and Marco Rosano added brass to “Isolationist Blues” and “The Lucky Ones”, while Naim Amor laid down the Electric 12 string lead you hear on “Heading Home”. The album was mixed by Nathan Sabatino (Dr.Dog, The Flaming Lips) at his Hi-Dez Recording studio in Joshua Tree, Ca. Ellis and Sabatino had known each other for several years when Matt enlisted Nathan to mix a one-off single in 2016. Delighted with the result, Ellis knew he wanted Nathan to take care of his next full length. The album was mastered by J.J. Golden and Produced by Matt. “Rambler Pacifico” is out now through Matt’s Krow Pie label and is available online for streaming and download at all major outlets. Recorded by Lewis Fordham, Fernando Sanchez, Nick Luca & Matt Ellis. Additional Engineering by Chris Shultz & Steve McCormick. Mixed by Nathan Sabatino. Mastered by J.J. Golden. Produced by Matt Ellis. Cover Art: Carga Máxima. Photography: J.D. Narro. The album was mixed by Nathan Sabatino (Dr.Dog, The Flaming Lips) at his Hi-Dez Recording studio in Joshua Tree, Ca. Ellis and Sabatino had known each other for several years when Matt enlisted Nathan to mix a one-off single in 2016. Delighted with the result, Ellis knew he wanted Nathan to take care of his next full length. The album was mastered by J.J. Golden and Produced by Matt. “Rambler Pacifico” is set for an independent release on March 29th through Matt’s Krow Pie label and will be available online for streaming and download at all major outlets. Visit www.mattellis.com for gig listings, music videos, social media links and more info. New Single "If I Had A Hammer" OUT NOW! “If I Had A Hammer“ is the second single off Matt Ellis’ sixth album, “Rambler Pacifico”, and is a cover of the Pete Seeger/Lee Hayes protest song from 1949. Featuring Kam Franklin on vocals, the song has been reimagined with a laid-back Laurel Canyon feel, but the message is still clear and more compelling than ever. Produced by Ellis, "Hammer..." was mixed by Nathan Sabatino (Dr.Dog/The Flaming Lips) in Joshua Tree, California and is available now on iTunes, Amazon, Spotify, and everywhere else you find good music. Shot during the 3rd Annual Women's March in Los Angeles, on January 19, 2019, the 360 video takes you into the event from the protestors POV. Click and drag your way through the environment and explore the positive energy fighting for ending violence, protection of reproductive rights, LGBTQIA rights, workers’ rights, equal pay for equal work, civil rights, disability rights, immigrant rights, indigenous people’s rights and environmental justice. Many thanks to J.D. Narro and the participants of the LA Women's March that made this video possible. "If I Had A Hammer" is out now. "Rambler Pacifico" will be available everywhere on 03.29.19. New single "Some People" OUT NOW! "Some People" is the first single off Matt Ellis’ new album, "Rambler Pacifico". The track is an acoustic stomp, full of country and folk-rock hooks with a lyric that weaves its way through the layers of modern diversity in America. Written by Ellis and recorded by Lewis Fordham and Fernando Sanchez, the track was mixed by Nathan Sabatino (Dr.Dog/The Flaming Lips/Giant Sand) at his Hi-Dez recording facility in Joshua Tree, California. “Some People” is built around Ellis’ core band with fellow Aussie expat Andy Clockwise adding backing vocals, and Austin’s Pete Okie Weiss on Accordion and Mandolin. Shot over two days in Los Angeles, the video features a cast of Matt's close friends and his family. Many thanks to J.D. Narro and the crew listed below that made this track and music video possible. Starring Matt, Magnolia, Banjo and Buzz Ellis and Vavine Tahapehi. Dave, Christina, Truman, Amelia, and Denali Conway. Boris the turtle. Marc, Lauren, Mazzy, and Esme O'Riley. Lacey Kay Cowden and Bootsie. Lewis and Lexi Fordham and Ralphie. Katie Benz Schwer and Chris Kitahara. Tim, Tara, Akita, and Zoey Williams, and Jillian Shannon, Dan Buran, and Whiskey Moonshine. MATT ELLIS’ SELF-PRODUCED 6TH ALBUM, “RAMBLER PACIFICO” IS OUT MARCH 29 2019. THE 1ST SINGLE IS COMING FEB 01. Come and kick-off the festive season with us at The Cinema Bar, Sat Dec 1st. Venice Singer/Songwriter, Matt Ellis, returns to curate the “Locals” stage at this year’s Abbot Kinney Festival, Sunday, Sept 30th. Located on the corner of Andalusia and Abbot Kinney, the stage is set to host 8 local music acts and the annual “Spirit of Venice Award”. The Abbot Kinney Festival Association is a 501(c)(3), a grant-making organization, that supports community-based organizations in Venice with an emphasis on youth, community, and the arts. while giving back at the same time. the stage served as a meeting point for so many, as friends old and new gathered for every act. 2018 is set to continue the 5-year tradition of promoting a stellar line-up of Venice based Singer/Songwriters, Bands, DJ Bright Moments and the Spirit of Venice Award Ceremony. The 33rd Annual Abbot Kinney Festival kicks off at 10am on Sunday, September 30th. Entry is free and open to all ages. More information is available online at www.abbotkinney.org. RSVP to the Facebook invite here and spread the word! We're thrilled to announce the release of this 4 CD Box Set out on Warner Music France, celebrating 45 years of Les Nocturnes, the legendary radio show on RTL hosted by George Lang. My track, "Greyhound 89", sits alongside The Byrds, Lynyrd Skynyrd, Jackson Brown, Johnny Cash, Emmylou Harris, Lou Reed and many more throughout the collection. The Box Set is available via www.amazon.fr online, and at most record stores throughout Europe. “Heart Of Mine” makes its cinematic debut with the release of James Franco‘s, “The Heyday Of The Insensitive Bastards”. is screening now in select Theaters and streaming via iTunes and Amazon. Huge thanks and congratulations to Mona Nahm (Writer) and Alex Nam (Editor) for the invitation to be a part of this incredible project. “Heart Of Mine” is available for download and streaming on iTunes, Amazon & Spotify.